The Lost Vikings, or TLV for short are one of those unique and high skill cap heroes you can pick in Heroes of the Storm. How do you play with three mini-heroes at once? In this article I'll introduce The Lost Vikings as Heroes of the Storm heroes and showcase my Vikings playstyle, which may be good on it's own or a way to learning 3-lane micro-management playstyle. Olaf: tanky Viking that has very strong HP regeneration when not taking damage for some time. Baleog: his attack does a cone shaped splash damage from the point where he hit. Very good at cleaning minion waves. Erik: fastest and weakest from the Vikings. Has a long range attack and can be use to chase and snipe dying heroes. So we have a tank, a specialist and a sniper. They can work together but the meta way to play them is to actually split them and operate in multiple places at once. That requires a lot of micromanagement and game awareness. 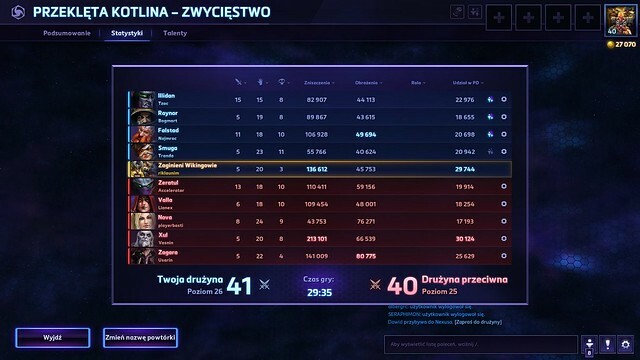 This is why many people see TLV as the hardest, most demanding heroes to play. At the moment Vikings aren't very strong. Their high win ratio is mostly due to low amount of new players versus old and experienced playing them. TLV are high risk - high reward type of heroes and the skill cap is very hight for a reason. You can control single Viking by selecting him or by picking 1, 2 or 3 on the keyboard 4 is for all. You can also select two of them. Vikings don't have a mount but their Z ability makes them move faster for a short period of time. The bigger the Viking, the slower he will be. As an Abathur player I had at least few games against TLV that were aggressive on the passive and hidden soaking. Even with bush shooting to find them they collected so much experience that I couldn't match. But in the end - one good late team fight and the advantage may be gone. TLV win if they don't allow late game. If the lane is taken by your team mates you don't have to keep a Viking there as no matter how many heroes are in range of minions - the amount of experience you can get is fixed. There are however other ways you can play Vikings. Instead of somewhat passive gameplay you can use them as a group. This doesn't require splitting your attention on multiple lanes, and as a group (still micro managed a bit) you can and have to do much more than casual lane pushing and soaking. One Viking isn't strong, but as a group they can win a lane against many heroes when one vs TLV. With some talents they can be good at offence in team fights. They won't be Illidan, but still with good management they can stun, hit and snipe heroes, tank some damage with Olaf, rush with Longboat and more. TLV can pretty much turn off Murky early game. In mid and late game Murky can still keep dying where as TLV can't and that's make them harder to play. As a disclaimer - I'll show my idea on playing Vikings. I do that on Quick Matches so with random teams and often against a bazylion of assassins like Li Ming, KaelTas, Nova or Zeratul. And it still works ;) 58 games with 55,2% win rate isn't bad. Experienced TLV players with experienced team mates may achieve more by using established best strategies, that they mastered with their godly micromanagement. Pick a lane and solo it (unless someone wants to help you). Avoid early game aggression on Sky Temple or Blackheart's Bay, focus on minions and securing a lane. The key point is to kill minions and not die yourself. If you have a strong opponent you will have to move constantly making attacking Vikings very hard. What I do is go into Baleog range, splash few shots on all minions, move back and then forward again. Enemy hero would either have to chase you through your minions up to your towers or will pull back - when you again do some damage with Baleog. If there is Li Ming or similar hero always use minions as your shield and move like crazy, even faster if there is Tyrande or Diablo with stun. Raynor and alike may be very annoying as you can't use minions as shield. In such cases you must use Ofal a lot. Vikings lane grinding may take some HP of the enemy hero and at some point it can be killed by focused attack. It's more obvious later one with Olaf stun and Spin to win talents. When enemies are cleaning your lane push or have to retreat take some camps. If you can take all of them, but be careful with going for enemy camps. Make sure enemy heroes are busy with something else. If you fight with a team mate (assassin or high DPS specialist) you can do a lot of damage - either to objective like a bush or when engaging enemy team for objective (like Dragon Shire where your DPS hero is aided by three annoying Vikings). This allows efficient team splits - like collecting seeds from both terrors, or split-taking bosses. When you are taking a boss or terror seeds Baleog and Erik have range greater than their AoE stun effect - move only with Olaf and let those two attack without breaks. Pick Regeneration Globes to increase TLV regeneration rate. TLV can take easiest camps solo nearly at the moment they became available (will require rotating Olaf with Baleog). I take harder camps starting mid game around 10+ levels. If you have aid you can do it much earlier. Vikings aren't Murky - if an enemy hero want to steal a camp you may try to counter him. It works best later on when you have the stun, spin and longboat. If there are multiple heroes and you are solo - run! Longboat is an escape and offensive ability at the same time. You buy some time and do damage. Team fights, securing map objectives is something TLV should participate if they can. You can't rush on the first line, but you must be there to help when needed. With proper talents and dodging Vikings can actually be useful. Keep Vikings somewhere between first and second line. If there will be a diver or an enemy out of position then try to attack. You may use Z to chase and kill fleeing dying hero. You may use Jump! talent to cancel effects targeted at you or flee from AoE effects. Butcher charge, Kaelthas bombs, and much more. It's a life saver and makes enemies hit countdowns on their important abilities. If you use Longboat heroic ability then use it as a rescue or initialisation ability. Players usually either scatter or try to take the ship down. If they spread pick the best target and chase, if they target you - try to lure them closer to your team. Vikings have normal respawn times so they shouldn't die completely mid/late game. When you take the The Sequel! some kill-trading is ok . If you are low on HP with cooldowns with no healer - leave TF and go to lanes/camps. Vikings look like easy target. This can be used to bring fresh meat to your friends. There was some talk on future of levels and leveling in World of Warcraft during Blizzcon as well as some ideas and comments from WoW content creators like Thete or Preach. Taking the opportunity I want to show my idea on how leveling and in bigger picture expansions could look like. Looking to hearing your opinions too! During the second Fallout 76 Beta I've managed to do some more hardware testing, including a ultra-wide 21:9 resolutions as well as some questing and events to check how the game longevity may hold. The Hunt for Red October have begun... or at least PC B.E.T.A. of Fallout 76. As it's a BETA, and Bethesda BETA at the same time there were issues but even against such odds I managed to play and test the game a bit. Here are my findings and impressions. Abathur, master of evolution and a specialist in Heroes of the Storm is one of the most unique heroes of HoTS or MOBA in general. His unique play style as well as multiple talent paths make him challenging yet very rewarding to play. In this article I'll try to describe Abathur and his game play options.